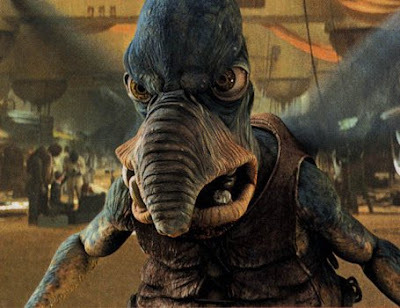 Was Watto meant to be an insulting stereotype of an Arab, a Jew, or just Semitic in general? I can’t take any credit for noting the similarity between Islam’s mystical figure, al-Khidr (the green man) and Yoda, much to my dismay. Here are a couple of links where knowledgeable people have written about it. As most “Star Wars” fans know, director George Lucas took spiritual elements, which are common in most major world religions to create his epic saga of good vs. evil. As a Muslim, I always thought of the “Jedi” as what a true follower of Islam should be like. Never mind the fact Jedi masters with their North African style cloaks and scruffy beards look like Sufi Sheikhs, but they way they are taught to respect a greater power, fight for the defense of the innocent and honor a code of morals and ethics in order to bring about peace and justice to their society, is basically what Islam teaches all Muslims to strive for. So what really is the connection between these similar Islamic principles and the fictional “Jedi Order” of the Star Wars saga? Back when “Episode I: The Phantom Menace” first came out, “The Muslim Magazine” had some interesting pieces on the connections between Islam and the content of the Star Wars films. One was an interview with Dhul-Nun Owen who talks about how George Lucas had contacted members of the “Habibiyyah Sufi Order” in Berkeley, CA in order to do research for “Star Wars.” There was also a piece by Mahmoud Shelton about how Sufi ideas of spiritual chivalry (“futuwwat”) have parallels in the Jedi teachings. Notice the Arabic term “al-Jeddi” (master of the mystic-warrior way) along with another Islamic term not mentioned, “Palawan” (similar to Lucas’ “Padwan” for Jedi apprentice) which were actual titles used by Muslim Knights! There is an interesting connection between the Jedi master “Yoda” (a short, green skinned creature first seen in “Episode V: The Empire Strikes Back”) and Islamic traditions. “Al-Khidr” means “the Green One” in Arabic. Qur’ânic commentators say that al-Khidr is one of the prophets; others refer to him simply as an angel who functions as a guide to those who seek God. And there are yet others who argue for his being a perfect wali meaning the one whom God has taken as a friend. So in other words “Yoda” (which means “Wise One” in Hebrew) is like an angel or spiritual mentor who guides the young Jedi in the ways of the force and to be strong enough to resist the temptations and evil inclinations of the Sith and other Dark Forces. Or how Coruscant (the capital of the galactic republic) sounds like Khorasan. Neat. I hadn’t noticed that one. KHORASAN, or Khorassan (i.e. “land of the sun”), a geographical term originally applied to the eastern of the four quarters (named from the cardinal points) into which the ancient monarchy of the Sassanians was divided. After the Arab conquest the name was retained both as the designation of a definite province and in a looser sense. I don’t know if this was edited or if it really went down this way…but I hope it really did. Band strikes up “Imperial March” from Star Wars (Darth Vader’s theme music) upon the arrival of Saudi Arabia’s King ‘Abdallah. There’s the man’s name ‘Abdallah, meaning “servant of God.” The “servant of…” part can be combined with any of the 99 names of God, such as ‘Abd-al-Rahman = servant of the Beneficent, ‘Abd-al-Hakam = servant of the Arbitrator, ‘Abd-al-Kabir = servant of the Great, and so on. There’s also the woman’s version, Amatallah. From what I’ve heard this isn’t very common in most parts of the Arab world, but common in Yemen, at least. It can also be combined with any of the names of God, such as Amat-al-Karim = servant of the Bountiful. Amatallah, you might notice, sounds very similar to Amidala. I think I may be the first nerd on the Internet to expose the Amatallah-Amidala connection. George Lucas sure did use a lot of desert imagery and such in Star Wars. As I peered inside one of the impeccably built constructions, I noticed a mattress and a small teapot on the sand floor. In a mere moment, the “owner” of the house was there: an elder Arab man dressed in a typical desert fashion. Surprisingly, his French was perfect and he explained to me that since he had neither family nor money, he came to live in the movie set. He looks after the place, the real roof of the fake house protects him from the sandstorms, and if a tourist throws him a small coin every once in a while, he can buy some more tea and some food. And he is hardly the only one living in the Lucas-built wonderland in the middle of the Sahara.